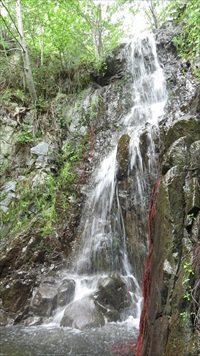 I have explored Etiwanda Canyon and Day Creek Canyon quite a bit and there are other water falls further up the canyons that most people never see. The ones to the left are most accessible and a short distance. Several of these have graffiti all over them. But if you follow the canyon up to the right two or three miles you will come to several impressive waterfalls and pools. Most people stop at the falls you have pictured, so if you go further up the canyon oftentimes there is no one else around. It can feel like you are walking through quite a jungle though because the riparian habitat is quite dense.